Sepang has to have been one of the most controversial races in the entire season so far. And not just because of what happened during the race. The entire fiasco started at the pre-race press conference in Malaysia, with Valentino Rossi accusing Marc Marquez of helping Jorge Lorenzo at the previous race at Phillip Island. Rossi claimed that Marquez was deliberately slowing him down and playing games with him. So even before the lights went off, all eyes were on 46 and 93. Even during FP3 and FP4, there was a lot of tension between the two riders as it appeared that Marquez was shadowing Rossi. 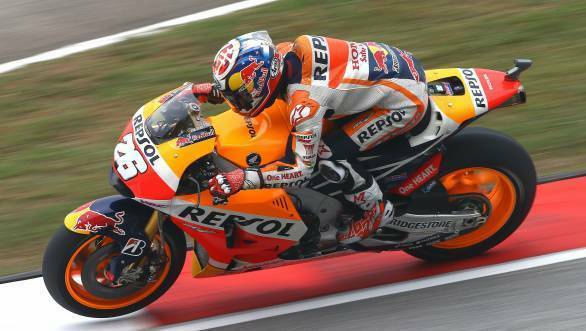 But by the end of qualifying, it was Dani Pedrosa that took pole position with Marquez in second place on the grid. Rossi put in a last minute fast lap to post a time that was 0.011 seconds faster that Lorenzo to take third place on the grid during the last lap of qualifying. The race started off with Pedrosa keeping his lead and Lorenzo getting stuck behind the two Ducatis of Andreas Iannone and Dovizioso. Behind Pedrosa was Marquez and Rossi. Lorenzo passed the two Ducatis by turn four and got involved in a brief battle with Rossi. Once he managed to pass his team-mate by the beginning of the second lap, he set his eyes on Marquez. Coming into turn four, Marquez ran wide, allowing Lorenzo to take second place. Now this is when it got interesting. Rossi and Marquez kept battling for third place with several overtakes happening around almost every corner at the circuit until the seventh lap. Coming into turn 14, Rossi ran wide. Marquez tried to take advantage of this and came around his outside. But he tried tightening his turn mid-corner and came into contact with Rossi's Yamaha. Rossi meanwhile appeared to have thrust his knee out to deflect Marquez away. Marquez lost control and suffered a low side, ending his race. Meanwhile, Lorenzo had increased his lead to close to five seconds and with only 12 laps remaining, there was no way Rossi could catch him. Lorenzo too had to be content with his second place as Pedrosa rode perfect lap after perfect lap to lead the race from start to finish. By the end of 20 laps, it was Pedrosa who took first place followed by Lorenzo and Rossi. This narrows the championship lead to 7 points with Rossi at 312 and Lorenzo at 305. Meanwhile, Bradley Smith secured a fourth place finish, followed by Cal Crutchlow and Danilo Petrucci. After the race, both Valentino Rossi and Marc Marquez were called into Race Direction where they were for quite a long while. No doubt the stewards were looking over the incident multiple times and hearing the versions of both the riders. 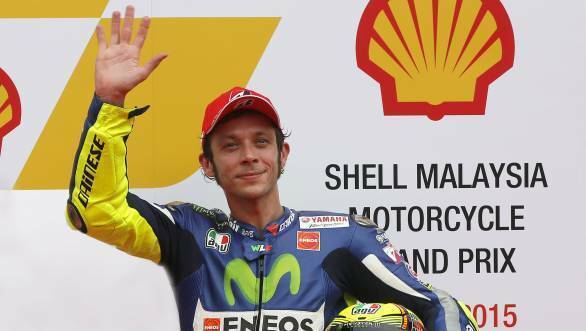 Ultimately it was deemed that Rossi could keep his points for the race at Sepang, which means that he still leads the championship by seven points. However, he has earned three penalty points on his license for what's been dubbed on Twitter as the #SepangClash, which, combined with the one penalty point on his license from Misano means that he will start the final race at Valancia from the back of the grid. Meanwhile, there are also accusations flying about that Lorenzo passed Rossi under a yellow flag. And several more rumours of more appeals from various factions. Stay tuned for more updates.